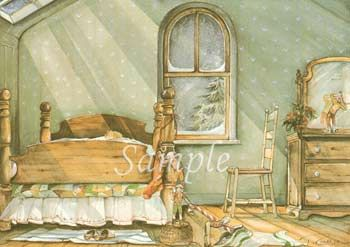 Trisha Romance Hand Signed and Numbered Limited Edition Print "Christmas Elves"
Image size:10 7/8 " x 15 1/2"
About the Print :Before ever being married or having children, this is what I imagined Christmas Eve would be...and so I painted "Christmas Elves". Never in my wildest dreams did I think it would one day be just like this! Our farmhouse was simple and yet cozy with our little blonde haired Nathan always wanting to fall asleep in Mommy and Daddy's bed on Christmas Eve. We tried to break this habit by saying - you must sleep in your own bed or the elves won't come. But he replied with confidence - don't worry Mommy they will find me.